As an Italian, one of the greatest pleasure of my day is coffee time. I don’t drink as many coffees as I used to in the past but those ones need to be really good! 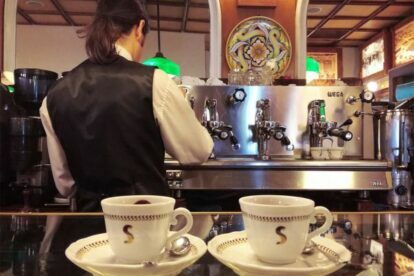 Of course, the first thing in enjoying a good espresso is the coffee itself, but then a lot of other aspects are of huge importance: the place, the people around you, the whole atmosphere… Sciascia has all of them! Sciascia is a very small and historical coffee place, located in the same spot since 1919 and that pretty much has never changed! I love its retrò style that you can see in everything there, from the furniture to the lettering of their logo. There are a few seats inside but the majority of the customers are served at the counter. Their staff is always nice and they serve you really quickly unless you want to take your time to enjoy a cappuccino or an hot chocolate at the table. My favorite thing here is coffee with chocolate (of course we are talking about espresso!). They put some dark chocolate in the bottom of the cup and then the coffee, so once you shake it with the little spoon you’ll mix it and I can assure you that it will have the right balance between coffee and chocolate… just the perfect taste!